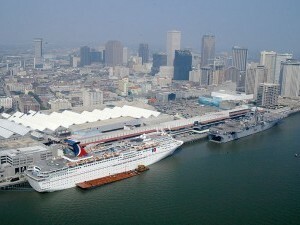 The New Orleans cruise port is quickly becoming the port of choice for many travelers and as it lies within a 500 mile drive for 47 million people, coupled with the fact that many lines use it as a home port transporting people to various destinations around the globe it is no difficult to see why. New Orleans cruises can take you to the Western Caribbean, the Eastern Caribbean, Mexico, Jamaica and even to Alaska, all from a friendly port close to home. Cruises departing from New Orleans do so from the state of the art port that is centrally located close to all the major attractions like the historic French Quarter and the mighty Mississippi River. The terminal itself offers parking for $16 per day in a monitored lot, or patrons can choose to stay at any number of hotels that offer parking and shuttle service as part of a cruise package. The New Orleans cruise port is also a destination in itself with the RiverWalk shopping mall, fine dining and proximity to the Aquarium of the Americas, a great day trip for the entire family. Choosing a Norwegian cruise from New Orleans can take you on any number of itineraries, from a short loop around the Gulf of Mexico to 34 day trip that hits various spots in the Caribbean, Central America, Mexico, stops on the Pacific coast of the United States and then travels on up to ports of call in Alaska before its final destination of Seattle is reached. The New Orleans cruise port can handle trips of these sizes and everything in between with ease and professionalism. When staying at one of the many local hotels, be sure to see if they offer a cruise and stay package like the Holiday Inn Downtown Superdome or the Loewe’s New Orleans Hotel who offer competitive room rates with either free or discounted parking and shuttles to and from the cruise port. Cruises from New Orleans can take you on cruises of all descriptions, whether you want the fun of cruising on Carnival or want to check out the ‘first at sea’ amenities afforded by Royal Caribbean. Whether you are looking for just a hop, skip and a jump over to Cozumel or a transatlantic crossing, the New Orleans cruise port and the ships that call it home have you covered. The hardest choice of all may just be which line to cruise with and which destinations to explore. Remember that booking early may just get you the best deals going, and don’t forget to call ahead to the hotel of choice if you want the best available rates for the cruise package.